It seems “After 6” is indeed a single coming from Rough Trade. Someone posted that this might happen already. Here is further evidence. Too bad “Snow in Sun” never made it past the promo stage. I never saw one that actually used the artwork. Perhaps “After 6” will go beyond the promo stage. Chart no. 1 at Christmas ? Definetely ! I look forward to any new tracks that may surface on the B-side but there doesn’t seem to be much strategy, to say the least. Tom Robinson said this would be released on 27th November but I can’t see that happening as there’s no trace of this (as far as I’m aware)on any release schedule or music retailer website. Then it’s December when the singles market is saturated – after that the tour is finished, the album is old news and with any luck Green will be onto another project. 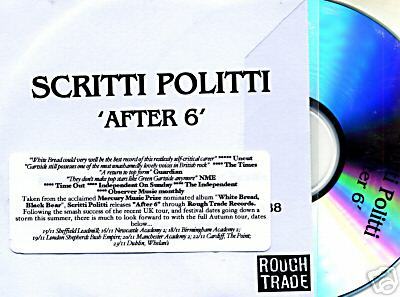 Of course no-one with any pragmaticism expects or hopes for great commercial success for Scritti and I don’t suppose Green or Rough Trade are at all vexed by that but the whole approach seems so half-assed, particularly as Green seems unusually willing to talk about his music these days. It makes a mockery of what Green said about Geoff Travis saying of A&B “I think you’ve made a great record but I don’t think you’re being promoted properly” – and I do realise that Travis was instrumental in getting Green back on stage but even so. Not meaning to sound negative – pretty much everything is going exceptionally well for Green and co.. It’s just that when you have some momentum from live shows and award nominations, etc, why not try and capitalise on that a little? Clearly, if Green wanted commercial success he would release a single with a video but has no intention of doing this. It would lead to judgment by a wider audience and from that would follow the familiar feelings of insecurity and low self-esteem which he has talked much about. The answer?…..bring out an album you made at home, don’t promote it with singles or videos, don’t produce a proper website, recruit an amateur band at the local pub and play in low-key venues! The unexpected Mercury prize nomination was not sufficient to derail this strategy and I don’t really understand what the purpose would be of releasing any further singles off WBBB, aside of providing a few collectors items for fanatics. Green seems happiest pretending not to be a popstar so why spoil everything by acting like one! As long as he makes great music, who cares if only a few of us get to hear it? Hurrah! Best track on WBBB by far – shame about SIS, but IMO this is the best possible replacement. There’s a lot of truth in what you say and most of the time I’m just grateful that Green’s back making music, allowing the lucky few to experience a great live show and finding the means to do all that in a way that’s as enjoyable and painless as possible. The slight frustration I feel is over things that would not compromise Green’s need for privacy but just come across as his record company being a bit useless. In response to your last sentence – yeah I do care, to some extent. At least I’d rather the music I love be accessible rather than some marginal cult for existing fans. I got into Scritti in my mid-teens with ‘Word Girl’ and promptly explored the back catalogue. Who’s to say there aren’t sensitive kids these days who’d do the same given an entry point? I agree with Richard W., that promoting the record a little more wouldn’t have to compromise GG at all. It’s the record company’s role. Not the merciless touring to promote. And yes, I’d prefer to see green go on to his next project rather than exhaust himself playing gigs for any reason other then he now enjoys playing gigs. For the record, re-the periods of Scritti history, i was a rabid fan in 78/79, lost a little interest around ‘Songs’ and totally phased out for Cupid and Psyche and Provision, a style I did not like at all… but I think Anomie is just about the best thing Green has done, and really love WBBB…. so I think there must be an audience of new music followers out there who would like to hear the new stuff, not just keep it (record company) to the faithful. 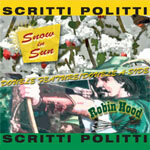 Personally, “Robin Hood” would’ve been my pick for a single, but “After Six” is a good choice as well. Any word on what tracks might appear as B-sides? I actually agree with you. I’m in favour of the music being heard by as many new fans as possible, but releasing singles quietly without video or promotion is not gonna achieve that. It will only provide a collectors item for the kind of die-hard fans that read this website. I’m sure if Green wanted his record company to adopt a different strategy he could pick up the phone! I’ve been a Scritti fan since the days of Wood Beez and the Scritti Crush Crew but my days of buying every single and expensive Japanese imports are over. I’m happy to own the album and leave it at that! Some of you may have noticed a US CD released by rough trade/nonesuch records that contains 3 Songs not found on “White Bread Black Beer.” It is a special edition released on a limited basis by Nonesuch Records in the US. Shame it’s not available in the UK at a sensible price…c’mon Rough Trade, get yer fingers out!! as this is a limited edition ‘free’ record, could we not mp3 it for this site? Not seen one of these before -anyone bought one? Are they any good?